One more trailer for this crazy awesome Russian superhero action movie titled Guardians, or Zashchitniki (Защитники) in Russian. We've previously featured two different trailers for this movie, but this final one might be the best yet. At the very least, it's packed with action - and this action is seriously impressive. I might go see this just for the action scenes alone, even if they're totally CGI, they still look cool. The plot is about a "Patriot" program that created a superhero squad, which included members of multiple soviet republics. There's a psychopath who wields sleek curved swords, a telekinetic, an invisible witch, and the most badass one of all, a massive "Werebear" wielding a minigun. Starring Valeriya Shkirando, Sanzhar Madiyev, Alina Lanina, Anton Pampushnyy, Sebastien Sisak & Vyacheslav Razbegaev. Fire it up. The plot synopsis for Zaschitniki on IMDb states: "During the Cold War, an organization called 'Patriot' created a super-hero squad, which includes members of multiple soviet republics. For years, the heroes had to hide their identities, but in hard times they must show themselves again." One of the commenters on io9 identifies the various superheroes seen in this: "So we got a Werebear, a psychopath with curved swords, a telekinetic with earth element powers and some sort of super powered witch." 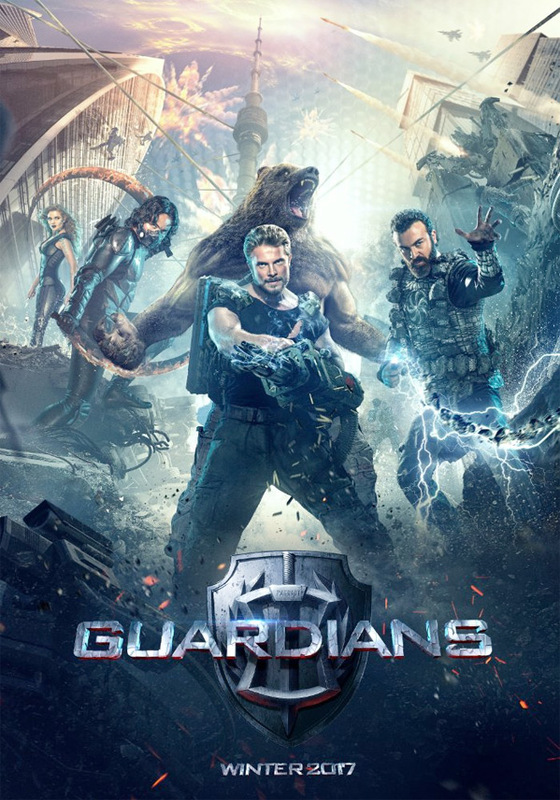 Guardians, or Zashchitniki in Russian, is directed by Armenian filmmaker Sarik Andreasyan, of The Earthquake, What Men Do!, and Mafia: Game of Survival previously. The film opens in Russia starting February 23rd, 2017, but has no US release date set yet. We'll be watching for more updates - stay tuned. Still excited to see this sometime? Indeed not so bad! Looks a full grown marvel movie! I wish Timur was involved, but damn, this looks fabulously bad. Looks like a cheesy good time, I'll definitely check it out. The trailer is nice to watch at. Tchaikovsky's music is always a delight to my ears. But can I watch a whole movie about a Russian version of Beor, Jane Storm, The winter soldier and the Thing blowing things for 2 hours or so? Well...If there a story that will bind everything together and a pinch of comedy, then why not. That bear dude....ALTERED BEASTS MOVIE!!! ALTERED BEASTS MOVIE!!! If anybody can follow American silliness with their super or meta humans, this is legitimate, too. Only, it's silliness, right? In Soviet Russia invisible woman disappears you! ...Winter Soldier, is that you? Super cheap computer graphic and weak acting skills actor,actress background so fake super low class Russian Superhero movie. all enemy walking/running around waiting to die. not plan to shoot n fight... 10min of movie start i fall asleep. only the loud shooting sound wake me up a few time. whole movie really waste of time and money watching. if no budget than go plan a love story movie. movie hrs: 1hr 29min. max star: 1 star. C.G star: 1 star.